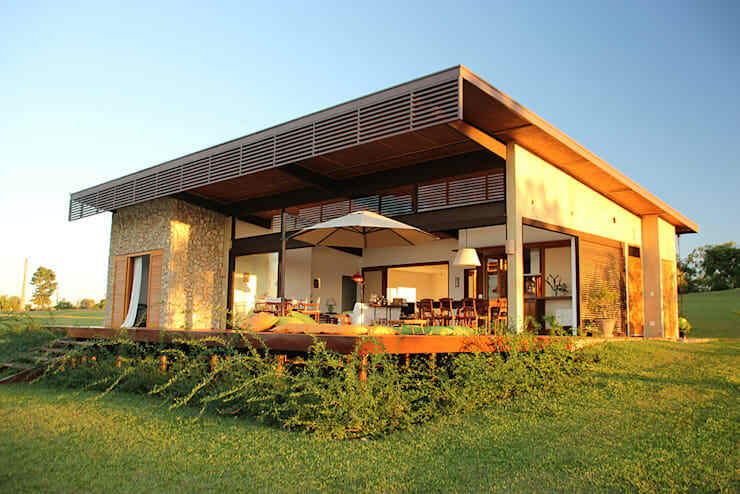 The skillion roof is a roof that tilts on one side. It's got a sharp and modern feel to it that instantly enhances the sophistication of buildings and even houses. Speaking of which, we will be looking at 10 bungalows that share skillion roofs but took that design to different stunning levels. Just read on to know about them. Now this image perfectly captures the skillion roof. In general, this house proves that a white and light brown palette can go a long way. Take a look at the sleek lines of the wooden surfaces and how these are nicely interrupted by the tall glass window. 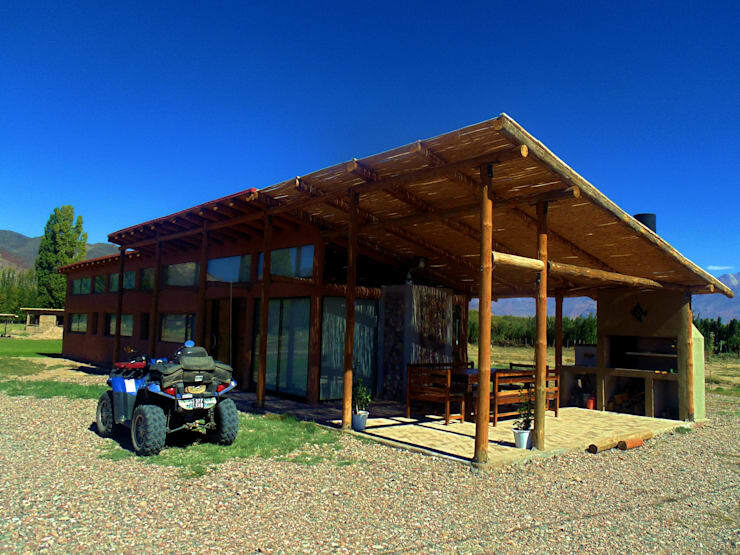 They even have a wide sliding glass door which makes this structure absolutely perfect for small cocktails especially since the veranda outside is spacious enough and visible from the inside. On another note, we also adore the warm lights from the false ceiling inside! Call it a lakeside villa or a vacation home, either way, this house caters to nothing but one's appreciation of a spectacular view. 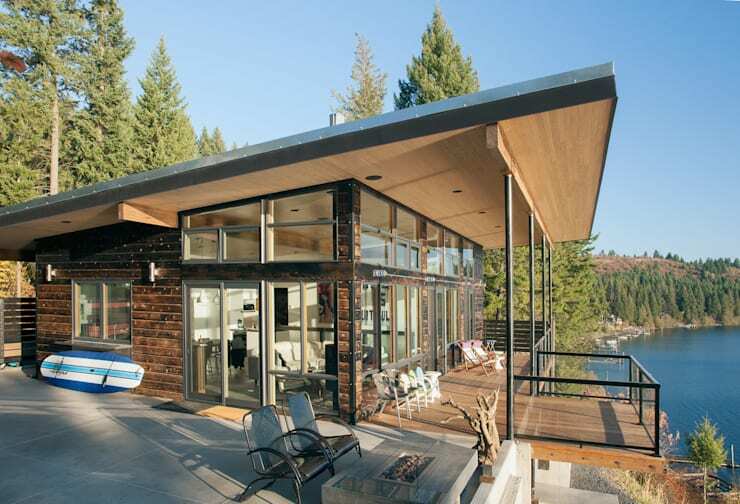 Unlike however those haphazardly-built lakeside cabins, this one values comfort and style which is mostly why the interior and this exterior look effortlessly chic and cozy at the same time. So if you do want to savor the sunrise or sunset by the lake, remember to tilt your design towards it and use industrial styled windows like these to keep you entertained even indoors. Asian architecture is also wonderful. Other than being minimalist, it just features wood in a unique and traditional manner even if nowadays it's mixed with modern designs. This residence for example has got contemporary portions but it's also tamed by the neat wooden framework by the front. The small garden also complements the Asian style of the structure, make no mistake about that. It's a bit strange how the thought of putting a skillion roof over another skillion roof sounds. 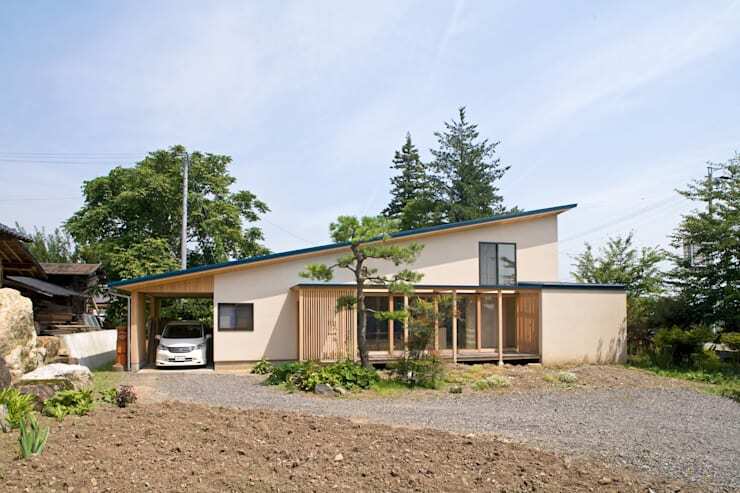 But it doesn't come off as awkward when you see this semi-detached house with layered slanting roofs. And if you think that the rain water will slide and cascade into the porch, think again because the roof on the right side attaches to a gutter that drains water and lets it pass through the down spout till finally the ground. This other house can pass for a mall or restaurant! 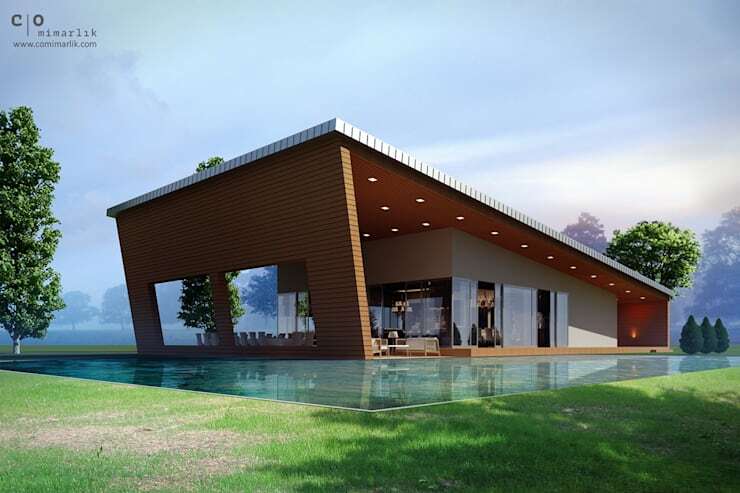 The tilted roof connects to an also slanting wall on one side which affords people from inside a clear picture of the pool area. You also have our permission to appreciate the neat ceiling lights on the porch. 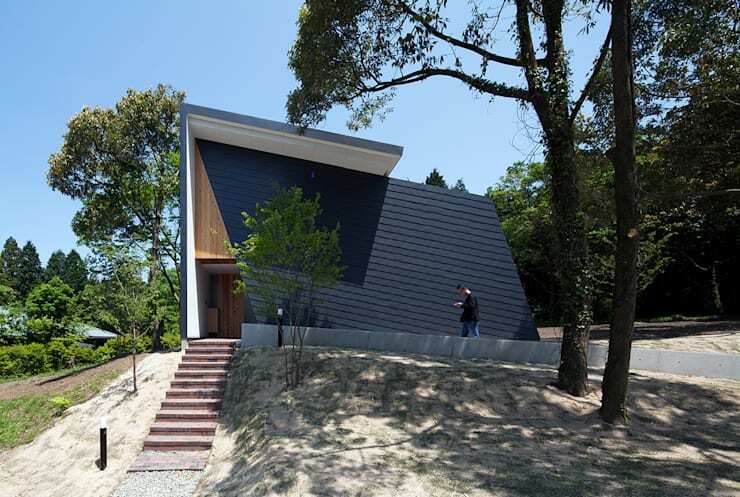 Here's an L-shaped house with multiple skillion roofs. The coolest part is that it's reminiscent of country homes because of the projecting wooden beams by the soffit, the white cladding and beneath it the light orange brick surfaces! The terrace here also seems like a great spot for the family to hang out at since it overlooks a quaint garden on the front. 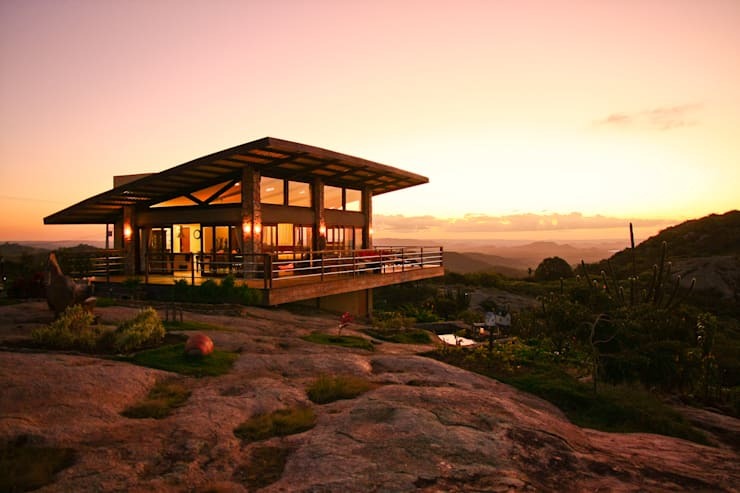 At 190 square meters, this house standing on a hill provides dwellers with spectacular scene from dawn to dusk. As an afterthought, it could also be perfect design and location for a restaurant. In any case, as with most of the slanting roofed homes we've shown, the architects on this one knew how natural light and an astonishing vista can benefit dwellers so it's strongly advised to utilize glass windows and build a balcony for a prime viewing of nature's gifts. 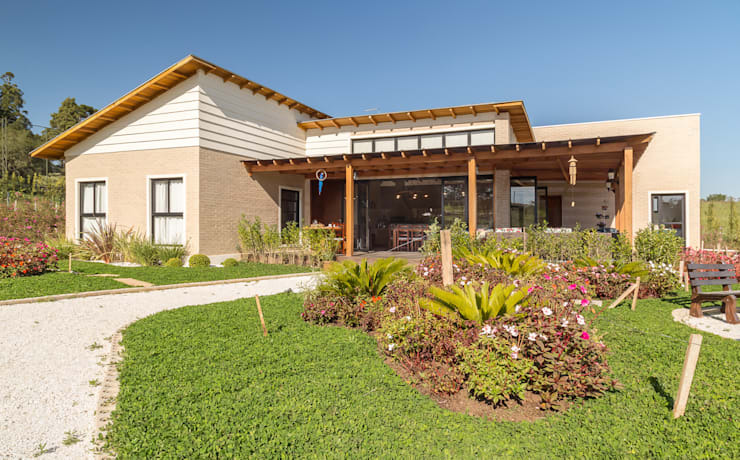 You can also choose to combine modern with familiar designs like an extended veranda made out of wood or even nipa or palm leaves for its roof. Not only does it tie you closer to materials endemic to Filipino housing, but it's also pretty cozy and laid-back. There's still another way to go about appreciating the sunset through your house's design and it is by opening your main hall and connecting it with porch. Arrange some modern and comfy furnishings and you're ready for a sunset viewing party with your family. This house gives you that and it even includes a beautiful stone surface for its exterior which evokes a bit of a rustic vibe. Channel state-of-the-art edifice by asking your architects to experiment on lines and angles the way this house turned out. It took advantage of its elevated terrain and used it as inspiration for the shape and geometry of the house. Another factor which amplified the sophistication on this house is its color scheme which is mysterious as it is dramatic.